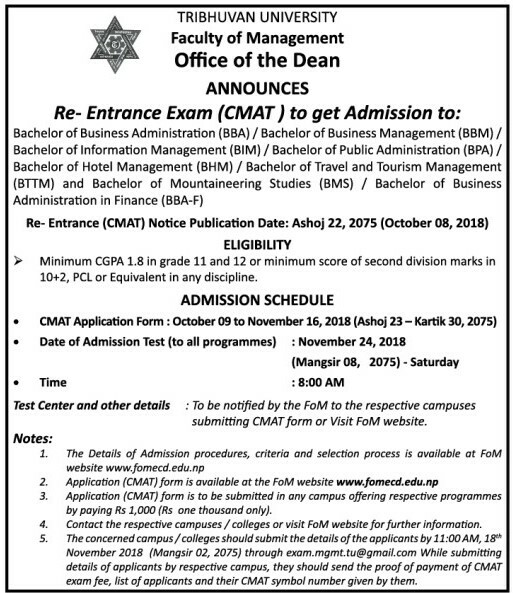 Tribhuvan University, Faculty of Management has announced Re-Entrance Examinations for the CMAT Exam 2018. Minimum CGPA 1.8 in grade 11 and 12 or minimum score of second division marks in 10+2, PCL or Equivalent in any discipline. > The concerned campus/colleges should submit the details of applicants by 11 AM, 18 November 2018 through exam.mgmt.tu@gmail.com.